The Authority adopted the FY2018-2023 Six Year Program on June 14, 2018. The program, which includes 44 regionally significant multimodal transportation projects, totals $1.285 billion. Adoption of this Six Year Program marked a milestone action for the Authority. It is the first time the regional transportation planning, programming and funding body has funded a six-year transportation program. The Six Year Program is a first of its kind at the Northern Virginia Transportation Authority, but it did not happen overnight. The Six Year Program Report details the pathway to Program adoption, documentation and project selection processes, funding strategy, and looking ahead to subsequent Six Year Program updates and continuation projects. The NVTA allocated its FY2014-2017 Regional Revenues through three separate funding programs, referred to as the FY2014, FY2015-16, and FY2017 Programs. Projects included in each of these funding programs were selected from TransAction 2040, the Authority’s long range transportation plan, adopted in November 2012. TransAction 2040 was replaced by a new long range transportation plan, referred to simply as TransAction, in October 2017. Following adoption of this updated version of TransAction on October 12, 2017, NVTA issued a Call for Regional Projects and consequently developed its inaugural Six Year Program for FY2018-23, beginning with its FY2018 revenues. Subsequently, the Six Year Program will be updated every two years. Project Eligibility: there are several pass/fail eligibility criteria that must be satisfied for a project to be funded using NVTA’s regional (70%) revenues. Candidate projects must be included in the current version of TransAction. They must also be wholly or substantially located in Northern Virginia, unless appropriate revenue sharing arrangements with neighboring jurisdictions are in place. TransAction Project Ratings: previously referred to as HB 599 ratings, these are project level ratings derived from post-processing analyses using the 15 weighted performance measures incorporated into TransAction, the long range transportation plan for Northern Virginia. Congestion Reduction Relative to Cost (CRRC) ratios: these are project level ratios derived from an analysis of the reduction in person hours of delay (in 2025 and 2040) divided by estimated total project cost. Qualitative Considerations: these include multiple factors that cannot be meaningfully evaluated under the previous two components. Factors may include modal and geographic balance, past performance, and leveraging of non-NVTA regional revenues. Public Comment: the public comment period is open between April 13 and May 20, 2018. The Authority had 60 candidate regional projects under consideration for its FY2018-23 Six Year Program. Using information from the submissions for project funding, NVTA staff created project description forms for all the candidate projects. In addition, the Authority accepted public comments on all candidate projects, from April 13, 2018 to midnight on May 20, 2018. The average funding request associated with each candidate projects is more than $41 million. 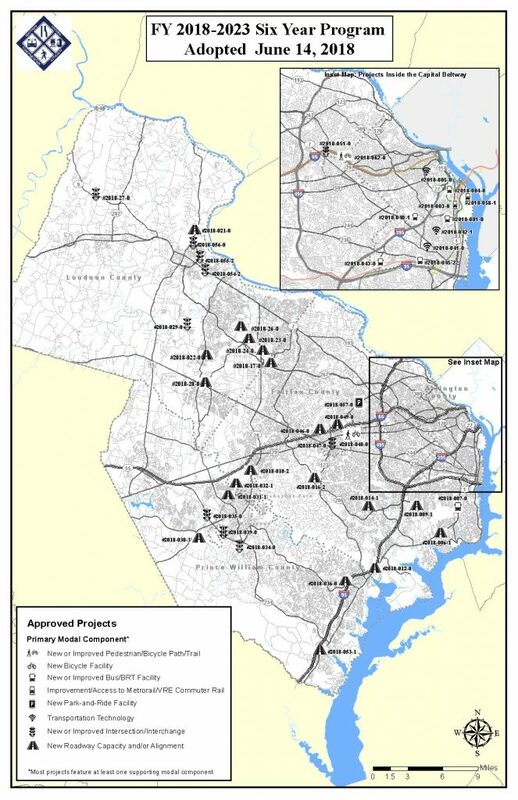 In keeping with the Authority’s track record of investing in multi-modal transportation improvements, these candidate projects include a broad range of modal components, such as pedestrian, bicycle, transit, rail, intersection improvements, highway improvements, park and ride, and transportation technologies. Scroll below for the map of our candidate projects and a link to our detailed project list. Learn more about the Public Comment period and the NVTA’s public outreach efforts. View a hi-res PDF of the SYP Candidate Project map. View the FY2018-23 SYP Candidate Project List. View the FY2018-23 SYP Candidate Project Description Forms for more information on individual projects. Once the Six Year Program’s public comment came to a close on May 20, 2018, NVTA staff completed the project selection process and developed staff recommendations for the Six Year Program. Then, the staff recommendations were shared with three of the Authority’s committees: first, with the Planning Coordination Advisory Committee (PCAC), second with the Technical Advisory Committee (TAC) and lastly with the Planning and Programming Committee (PPC). The PPC recommended to the Authority four changes to the staff recommendations. The Authority adopted the FY2018-2023 Six Year Program with the PPC’s recommendations. See the NVTA Staff Recommendations for the FY2018-2023 Six Year Program. 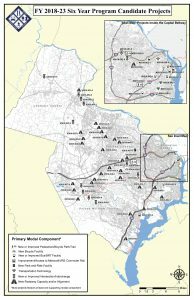 Northern Virginia’s jurisdictions and agencies can now apply for regional transportation projects to be funded through the NVTA’s FY 2018-2023 Six Year Program. View the application now. Noon, January 19, 2018 — Deadline for Governing Body resolution(s) of support. Note: The purpose of the later deadline for Governing Body resolutions is to provide some scheduling flexibility for jurisdictions and agencies during the Holiday season. Whether this additional time is needed to pass a resolution for a jurisdiction’s own applications, or in support of another jurisdiction’s applications, is not material. This framework describes how TransAction and the FY2018‐2023 Six Year Program will be integrated, describes how the Six Year Program will be developed and identifies roles, responsibilities, schedule, and other aspects of the Six Year Program.